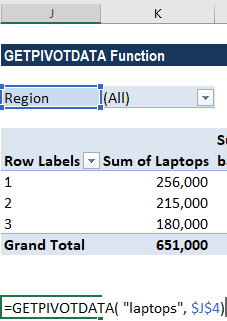 What is the GETPIVOTDATA Function? The GETPIVOTDATA Function is categorized under Lookup and Reference functions.FunctionsList of the most important Excel functions for financial analysts. This cheat sheet covers 100s of functions that are critical to know as an Excel analyst The function helps to extract data from specified fields in an Excel Pivot Table. The pivot table is used often in financial analysisFinancial Analyst Job DescriptionSee a real Financial Analyst Job Description including all the skills, experience, and education required to be the successful candidate for the job. Perform financial forecasting, reporting, and operational metrics tracking, analyze financial data, create financial models to facilitate deeper analysis of given data. The function helps extract, group or add data from a pivot table. Data_field (required argument) – It is the worksheet information from which we intend to remove nonprintable characters. Pivot_table (required argument) – It is a reference to a cell, range of cell or named range of cells in a pivot table. We use the reference to specify the pivot table. Field1, Item1, Field2, Item2 (optional argument) – It is a field/item pair. There are up to 126 pairs of field names and item names that describe the data that we wish to retrieve. Dates are entered as date serial numbers by using the DATE function so that they are in the proper date format. Numbers can be entered directly. Time should be entered in decimals or as the TIME function. Suppose we wish to get the sum of laptops from the pivot table given above. 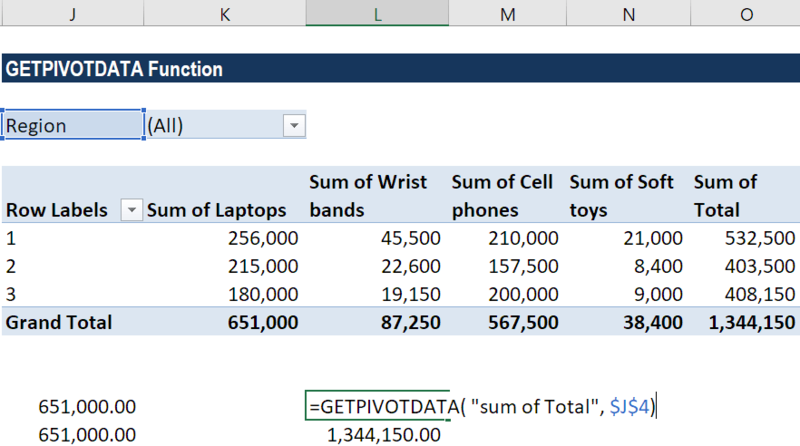 In such scenario, we will use the formula =GETPIVOTDATA( “laptops”, $J$4) and get the result as 651,000. Now, we wish to get the total sales. The formula to use will be =GETPIVOTDATA( “sum of Total”, $J$4). 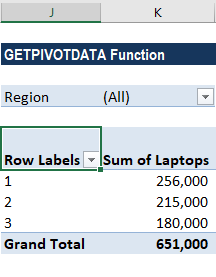 Using the GETPIVOTDATA function with the DATE Function (Example 2) – Here, instead of just typing the date in the formula, we can refer to a cell that contains a valid date, in any format recognized as a date by MS Excel. 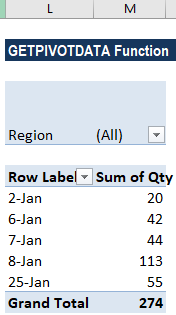 The formula to be used is =GETPIVOTDATA(“Qty”,$L$6,”Date”,S5). The given pivot_table reference does not relate to a pivot table. When we provide invalid fields for arguments data_field, [field] or [item]. The field details are not displayed in the specified pivot table. Remember that if an item contains a date, it should be in date format or serial number. 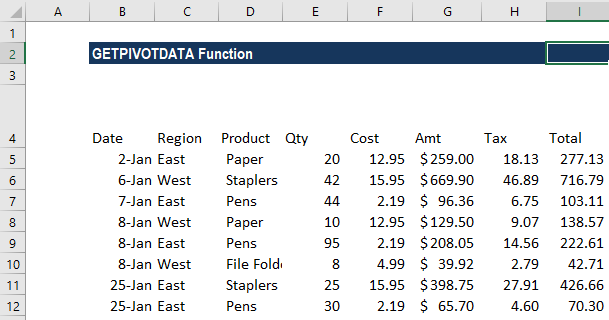 The function can be automatically inserted by enabling ‘Use GetPivotData functions for PivotTable references’ option in MS Excel.